UPDATE: Ice Cream Sandwich update finally arrives on the Sony Tablet S | What Hi-Fi? It's here at last! Ice Cream Sandwich, the latest version of Android's operating system, has finally arrived on the Sony Tablet S.
We've just updated ours via wi-fi (we got an automatic alert as soon as we turned the tablet on), and in a couple of minutes we were up and running. Full details of what the upgrade brings are in our original story below. 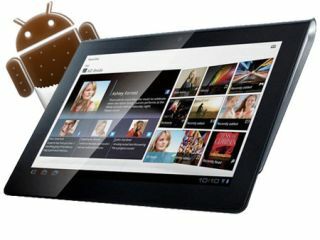 The Android 4.0 (Ice Cream Sandwich) update for Sony's Tablet S will be available for UK owners at the end of May. Improvements include a new, streamlined user interface with drag & drop folder creation, improved multi-tasking and browser. Android 4.0 also brings direct full-sized SD card access, always-on small apps and enhanced photo viewing options. Frequently used functions are kept within easy reach with the new small apps update. An 'always-on-top' launcher icon gives instant access to browser, remote control and calculator apps while you're using other tablet functions. Other recently-used apps can be dismissed with a swipe, the new browser lets you toggle instantly between desktop- and mobile-optimised websites, and pages can be saved for offline reading when there's no wi-fi connection. As for the enhanced camera and photo functionality, there's a choice of more editing features and slideshow templates. Existing Sony Tablet S owners should receive an automatic notification when the upgrade is available. Sony has confirmed to whathifi.com that its Android 4.0 (Ice Cream Sandwich) upgrade for the Tablet S, now being rolled out in the US, is not yet ready for UK release. "It's coming soon and we'll let you know when it lands," a spokesperson for Sony UK told us today. So it looks as if we'll have to be patient. When we do get it, the standard Ice Cream Sandwich features will all be present and accounted for – though Sony has added a few little flourishes to keep things fresh, like the ability to move around app windows, desktop style, and drag icons together to create folders. To get the ICS update, you just need to connect your Tablet S to a wi-fi network and you should be prompted to upgrade. We'll let you know as soon as the Android 4.0 update becomes available.